India's first robotic Mars probe set sail for the Red Planet Saturday (Nov. 30) with a vital rocket burn to catapult the spacecraft out of the realm of Earth's gravity and into interplanetary space. The $72 million mission has a trip of more than 400 million miles (643.7 million kilometers) ahead of it. The probe will fly halfway around the sun while moving out toward the orbit of Mars, intercepting the Red Planet Sept. 24 for another major rocket maneuver to place itself into orbit. 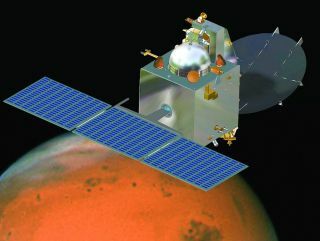 India's first mission to Mars, the Mars Orbiter Mission, launches the Mangalyaan orbiter toward the Red Planet atop a Polar Satellite Launch Vehicle on Nov. 5, 2013 from the Indian Space Research Organisation's Satish Dhawan Space Centre in Sriharikota. Operating from a perch taking the spacecraft from just above the Martian atmosphere to a peak altitude of nearly 50,000 miles (80,467 km), the Mars probe will observe the planet with five science instruments, gathering data on the history of the Martian climate and the mineral make-up of its surface. You can follow India's Mars probe with SPACE.com partner Spaceflight Now via the Mars Orbiter Mission Mission Status Center here. Follow Stephen Clark on Twitter: @StephenClark1.Copyright 2013 SpaceflightNow.com, all rights reserved.